The freezing weather that covered much of New Orleans in a thin layer of crunchy ice overnight continued Wednesday morning, and officials urged residents to minimize their driving and take other precautions as schools and businesses remained closed. 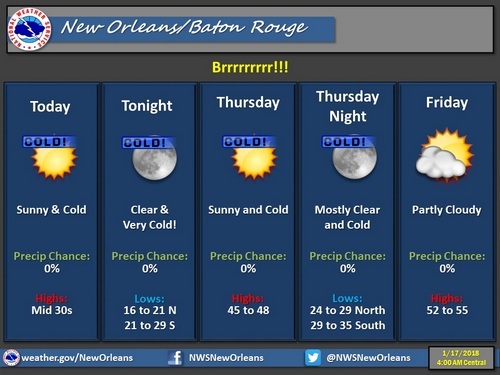 Temperatures in New Orleans were expected to rise into the 30s during the day Wednesday, then plunge again into the 20s overnight. Wind chill, however, was expected to be in single-digit temperatures, and with ice on the roads, residents are asked to refrain from driving if possible. New Orlenas police and other first responders handled more than 600 calls overnight Tuesday, many of which were traffic crashes because of the icy roads. A male pedestrian was fatally hit on the Interstate 10 high-rise, and his body was found near the Louisa Street exit. “I want to thank all of our citizens and visitors who heeded our warnings and urge everyone to continue to exercise caution until the conditions of our streets, highways and bridges are safe. Given the low temperatures, we must remain vigilant and take the necessary steps to keep our families and property safe,” Mayor Mitch Landrieu said in a news release late Wednesday morning. Interstate 10 remains closed from Metairie to Slidell, and Leon C. Simon Drive is closed between Press Drive and Downman Road. Streetcars are closed, though some bus lines are running. All New Orleans schools and universities are closed Wednesday as well, as is City Hall, all court branches, public libraries and recreation facilities. City work crews and the state Department of Transportation and Development have placed sand on the Broad Street overpass, Chef Menteur Highway and Read Boulevard, and are working on the Jefferson Davis overpass and the intersection of Washington Avenue and Earhart Boulevard. Meanwhile, officials also encouraged residents to be sure not to leave space heaters unattended and to refrain from ever using an oven to heat their homes. To reduce the risk of pipes freezing, residents should insulate water lines, turn off water to their home, or leave a “pencil-lead thin” stream of water running from the faucet.